Karen Favis Carlos, the owner and manager of Glamworks Events Management, has issued an official statement with regards to the accusation of one of her previous clients that she is a scammer. Carlos posted the statement on the official website of Glamworks Events Management a day after a post accusing her of being a scammer went viral on Facebook. 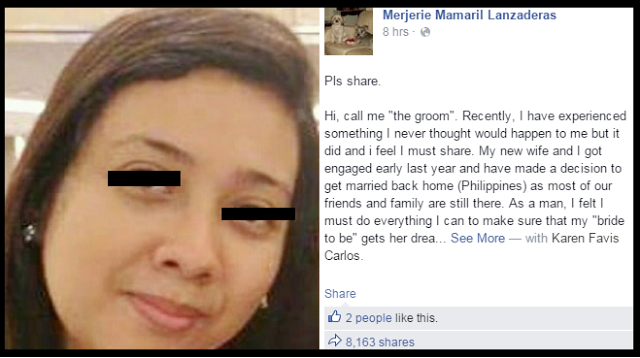 It can be recalled that a couple of days ago, Jemerson Mamaril (a former client of Carlos) posted on Facebook a long article detailing what transpired last July 18 when he married his fiance Erin Santos. According to Mamaril, Carlos failed miserably in her duties as the couple's designated wedding coordinator. Below is a full copy of the official statement released by Karen Favis Carlos through the Glamworks website. "It is with regret that the Wedding of Jemerson Mamaril and Erin Santos last July 18, 2015 at Fernbrook Gardens, Daang Hari, Muntinlupa City did not go smoothly as it should be. My husband, Perry Carlos III, went to the event to personally see to it that the wedding, though not perfect, will push through as scheduled. Majority of the suppliers were paid and settled on the night of the event, some were issued checks (that were cleared, suppliers can attest to this) to cover for their corresponding payments. I will forever regret the lapses that I may have committed, as it affected a lot of people. The recent Facebook post as well as the number of shares, likes, reposts, as well as the bashers who, unfortunately, included my whole family, affected us deeply. Dragging my family into this mess was uncalled for, as we are already in touch with the couple’s lawyer since the evening of the event. We are also looking into seeking assistance with the Anti Cyber-Bullying task force to see if something can be done about the malicious comments that arose from the post, given the fact that there was a photograph of my whole family with my then 1 ½ year old daughter in it. I am not convicted of any crime, nor am I running away from any authorities. I am seeking for the kind understanding of everyone to at least, give me a chance to straighten things out. I have been in the Wedding Industry since 2010 handling over 100 couples. I am not a serial scammer, a fly-by-night Coordinator nor a thief. We look forward to settling this legally, without having to ruin my name and my family. Please spare some thought for my family, most especially my 3 year old daughter who is starting to understand what is going on in our household. It pains me so much to see her suffering due to the fact that I haven’t been tending to her the way I do. I would like to take this opportunity to thank people who saw best not to comment nor repost. That small act means a lot to us. Please continue to pray for us as we try our best to pick up the pieces. Finally, I would like to apologize to the couple for the pain this has caused. I understand that I may not gain your sympathy, but please know, from the bottom of my heart, that I am truly sorry for what happened. God Bless everyone and thank you for taking the time to read this."